Epicurean Butter manufactures infused butters, combining grade AA butter with all natural ingredients using proprietary recipes. Our recipes include both sweet and savory categories and are intended to bring restaurant chef quality preparation to the home gourmet cook. These infused butters allowing anyone, experienced or novice, to cook, finish and enhance home cooked meals in the same exquisite manner as high-end restaurants. Epicurean Butter is wonderfully delicious! 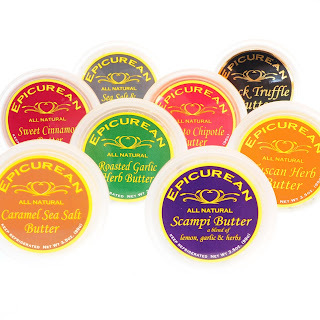 Each flavor is so good and I love that Epicurean Butters have multiple uses. I used many for cooking and many for spreading over toast or bagels. The pumpkin spice and Orange honey were my favorite for spreading over bagels and a perfect alternative to cream cheese. The garlic herb make my homemade garlic bread taste out of this world. The seasonings in each butter is absolutely perfect. Not to strong and not too weak. Absolutely incredible! Epicurean Butter's are the perfect gourmet treat! Click HERE to find a store near you that sells Epicurean Butter! Click HERE to learn more about Epicurean Butter! Follow Epicurean Butter on social media!